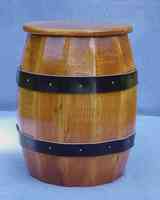 Two men are quarrelling over an open barrel with some wine in it. One says "Less than half is full." But the other maintains that more than half of the barrel is filled. How can they find out which is right without taking any wine out or or using any measuring instruments?